The recent delivery and orders for several new midsize ships signify a change in cruise ship development, one that harks back to the traditional days of cruising and make the big new ships begin to look like circuses. At the same time, the small ship market continues to evolve, with the smallest Seabourn ships soon to go to Windstar Cruises. Meanwhile, elsewhere, Carnival Cruise Lines continues the trend of adding extra charges to mainline cruises, with the addition of live concerts at a charge on board eight of its ships in the Caribbean and Mexico. The delivery of Oceania Cruises’ 66,048-ton Marina and Riviera (1,250 passengers each) in 2011 and 2012 and Hapag-Lloyd Cruises’ 42,830-ton Europa 2 (516 passengers) last year, together with orders for a pair (with options for four more) of 47,800-ton ships, capable of carrying 925 passengers each, by Viking Ocean Cruises, of which the first, Viking Star, is to enter service in May 2015, have begun what we hope is a new trend in the market. This trend is to more vessels in the more traditional size sector between 40,000 to 60,000 tons. This trend has been reinforced recently by the latest order from Seabourn, which calls for a vessel of 40,350 tons capable of carrying 604 cruisers. This is one-quarter more tonnage and one-third more passengers than the largest existing Seabourn ship, meaning a slightly lower passenger space ratio, about 9.55 less than the most recent ships. 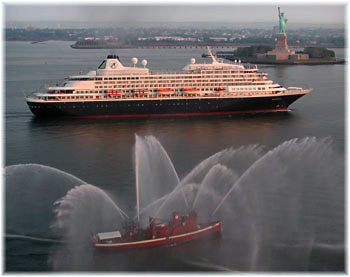 What is interesting about the new ship, especially since Holland America took over management of the Seabourn brand, is that in tonnage terms she will actually be larger than Holland America’s 38,100-ton Prinsendam, with her 835 passengers. Interestingly, Prinsendam once operated as Seabourn Sun and was actually the first mid-size Seabourn ship, especially when compared with the original 212-passenger trio of Seabourn Legend, Seabourn Pride and Seabourn Spirit. Within the same general bracket is Douglas Ward’s measure for midsize cruise ships at Berlitz Complete Guide to Cruising and Cruise Ships (750 to 1,750 passengers), and although some of the ships cited carry fewer in numbers, they are of about the same tonnage. Whatever the exact measure, there is a clear increase in the number of ships being built in this range. The days of megaships such as the 5,408-passenger Oasis of the Seas are not over of course, as while Royal Caribbean has more recently come up with the more moderate 4,180-passenger Quantum size, it continues to experiment with the Oasis in Europe and has indeed ordered another Oasis class vessel from STX France. 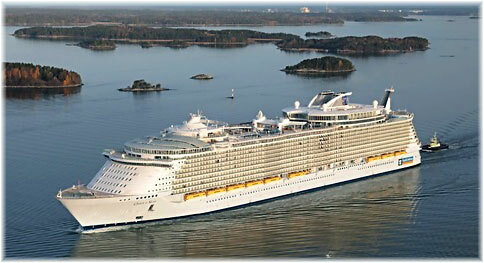 But the latest rumour is that Royal Caribbean will not exercise its option for yet another of the class. In the long run, however, it is quite possible that ships of this size may find another home in the Far East market. What is key about the new mid-size fleet, however, is that they mark a return to the traditional style of cruising and are clearly differentiated from the megaships that are so popular today, so much so that on an architectural scale, the new mid-size ships can be compared concert halls, as opposed to the football stadium-scale of the big ships, just as in their day, the small luxury ships once called themselves boutique. Clearly the market for cruising is now dividing itself between the megaships and a resurgence of mid-size ships. This is interesting when it is noted that the public can pay for a day on one of the new midsize ships, where things are both more exclusive and more inclusive, what one might pay for a week on a megaship, where many of the extras cost money and the cruise line seems constantly to be trying to dip its hand into one’s wallet. As one commentator put it some time back, it’s not what it costs to get on the ship, it’s what it costs to get off. Essentially, the new midsize ships are developing into the First Class of 21st Century cruising while the megaships are becoming the Tourist Class. With Seabourn’s sale of its three smallest vessels, the 212-berth Seabourn Legend, Pride and Spirit to Windstar Cruises, will soon join the 148-berth sailing ships Wind Spirit and Wind Star and 312-berth fleetmate Wind Surf, likely as Star Legend, Star Pride and Star Spirit. 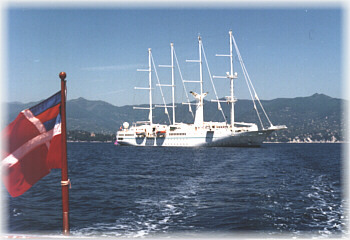 Indeed, Star Pride enters service for Windstar this spring. Following renovation, she will set sail this May in the Mediterranean. 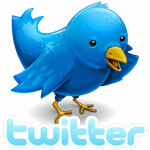 The Legend will follow a year later, in April 2015 and the Spirit a month after that, in May 2015. After a summer season in the Mediterranean, the Star Pride will move to the Arabian Gulf and then to Southeast Asia for the winter. One interesting prospect is that, although nothing yet has been said about this and itineraries have so far been announced only for the Star Pride, Windstar could well decide to bring one of the former Seabourn trio into the Alaska trade. In the Alaska market, while Un-Cruise Adventures has filled part of the gap created by the demise of Cruise West in 2010, the replacement has not been complete. 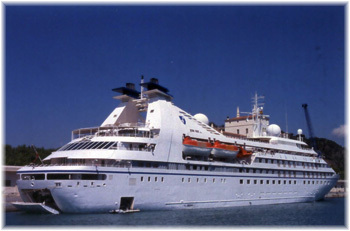 The Un-Cruise fleet consists of seven ships of 22 to 88 berths each, with the s.s. Legacy as flagship, while Cruise West also had seven vessels, but in the range of 60 to 114 berths, with the Spirit of Oceanus as flagship. 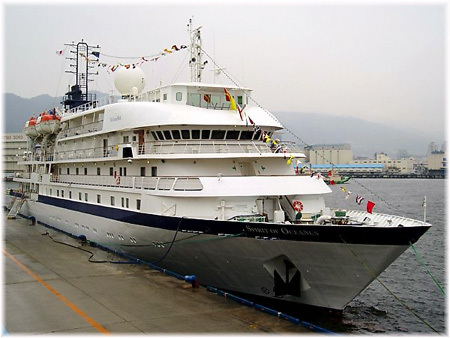 The role that was once played by the Spirit of Oceanus has not yet been filled in the Alaska trade, and one wonders if this might not happen in 2015 when Windstar will have its next two former Seabourn vessels coming available. Over the past several years, in order to try to keep ticket prices down, the cruise lines have added more and more in the way of extra-tariff amenities, services and facilities. Among the best-known of these are extra-tariff restaurants and coffee shops, bridge, galley and engine room tours that used to be free of charge but now must be paid for and now, with this latest move, some elements of the entertainment. Last week, to set themselves apart, Carnival Cruise Lines announced that it had started recruiting name entertainment to appear on its ships in port, under the banner of Carnival Live. Tickets will cost $20 to $40 per passenger while they will range from $100 to $150 for the VIP experience, which includes an artist meet and greet, photo opportunity, seating in the first three rows and a commemorative laminated concert pass. Tickets can be purchased through Carnival’s online shore excursion reservation system. Performers and bands scheduled to perform in this new program include Chicago, Daughtry, Foreigner, Gavin De Graw, Jennifer Hudson, Jewel, Kansas, Lady Antebellum, LeAnn Rimes, Martina McBride, Olivia Newton-John, REO Speedwagon, Styx, Trace Adkins and 38 Special. In all, fifteen artists will perform some forty-nine concerts on eight ships while docked in Cozumel, Nassau and Catalina Island. 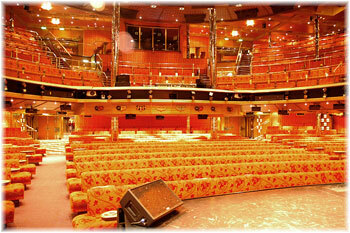 Artists will join the ship while in port, perform in the main theatre and then depart after their shows. Bands have been chosen through a survey of Carnival’s own passengers concerning their music choices. Styx will kick off the series with an April 7 show on board Fantasy in Nassau. It is estimated that this series alone will net Carnival several million dollars a year in extra revenues. A full list of 2014 Carnival Live concert dates can be found on Carnival’s website.